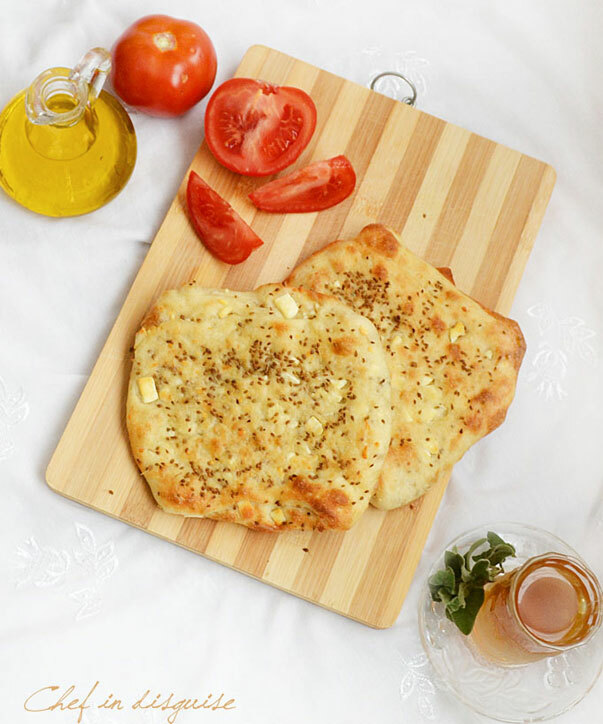 This fteer or flat bread which is also known as Palestinian peasant pastry can be made with a variety of fillings. In a bowl add the vegetable oil and olive oil and keep it next to your working area. Fold one-third of the rectangle over the middle third, cover it with your filling of choice. Allow this one to rest while you start working on the next one. Once you have stuffed and folded all the dough balls, go back to the first square and brush it with oil and spread it into a larger square using a rolling-pin or your hands. Then do the same with the rest of your squares. 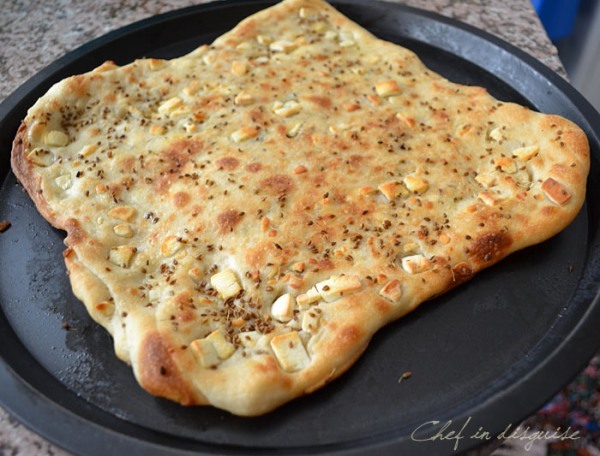 Transfer the dough to a baking sheet that you have brushed with oil and sprinkle them with anise. Once the bottom is golden brown, turn on the broiler till the tops are golden brown too. Allow the bread to cool on a wire rack for 7-10 minutes and then cover with a clean dry cloth to keep it from becoming dry. This bread can be frozen for up to 3 months, just wrap well in a plastic bag and freeze it.When you want to eat it just get it out of the freezer and into a heated oven for a few minutes till it is warmed through and it will be as good as new You can make the bread in a smaller individual portion size by cutting the dough into smaller balls (16 balls instead of 8 if you are making the whole recipe) Nabulsi cheese is a salty firm cheese made from goat’s milk, I will be sharing the recipe and the step by step procedure to making it in a post coming very soon. If you can’t find it, you can replace it with any firm and salty cheese you like The filling can be adapted to your liking. Spinach and onions, oregano and green onions, or almonds are the traditional choices but you can try new and different combinations,use your imagination.